Nothing can take the place of a fresh tomato. But when it comes to preserving tomatoes, which is the best method: canning tomatoes, drying tomatoes, or freezing tomatoes? The answer is … all three. Each method for preserving tomatoes has benefits and drawbacks. 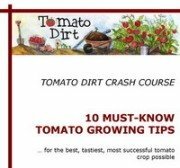 Here’s the dirt on each one so you can decide what to do with the extras in your tomato crop. Taste. Aficionados argue that you can preserve more fresh tomato flavor with canned tomatoes. Volume. Canning is an especially useful route for preserving tomatoes when you have large quantities to process at one time – like when your determinate tomato crop comes in. Versatility. Home canned tomatoes have a texture similar to commercially-produced canned tomatoes and are often eaten directly as a side dish, rather than being used solely for cooking. They also work well in casseroles, soups, stews, and sauces. Safety. Tomatoes are one of the easiest types of produce to can safely. Longevity. You won’t lose canned tomatoes in a power outage as you might with frozen tomatoes when a freezer’s power is cut off. Space. Canned tomatoes save on precious freezer space. Gear. Canning requires special equipment﻿ including a hot water bath canner or a pressure canner, canning jars, and lids. However, you can use the canner for preserving other vegetables, fruits, and even meats. And you can use canning jars again year after year. Discomfort. You may heat up your kitchen when canning which can be especially uncomfortable in the summer months. Space. Dried tomatoes take less storage space than other preserved tomatoes. Cost. If you choose to dry tomatoes in a dehydrator, you must purchase one. However, you can use for year after year and you can use it to preserve other fruits and vegetables, too. Time. Using a dehydrator can burn up t 8-12 hours per batch. It takes longer to dry tomatoes than to freeze or can them. Limited Usability. Dried tomatoes are used in fewer recipes than canned or frozen tomatoes. In addition, they need to be reconstituted before using. Convenience. The easiest method for preserving tomatoes is freezing them. The process is simple and least messy of all three. Speed. Since you don’t need to cook tomatoes that you freeze, it is the fastest method. You wash tomatoes, remove their stems, pop them in a freezer bag, and you’re done. Usability. Frozen tomatoes work well in recipes (sauces, casseroles, soups, stews, and chili for instance). For recipes where you’re going to cook tomatoes anyway, freezing them makes sense. Flexibility. Small quantities work. You can freeze a few containers of tomatoes as they ripen and avoid heating up the entire kitchen. This kind of flexibility is especially helpful if you grow indeterminate tomatoes, which ripen throughout the season and not all at once like determinates. Another nod to versatility: you can use freezer bags or plastic freezer boxes. Canning, on the other hand, requires large amounts of tomatoes to be worth your time and special canning jars to store the finished product. Flavor. Freezing tomatoes reduces their flavor. Enzymes responsible for a tomato’s taste are rendered inactive below 50ºF. Space. Frozen tomatoes take up a lot of valuable freezer space. Depending on what you might need to use that real estate for, canning might be the way to go. You can also “temporarily” freeze tomatoes whole when you harvest them, and then when the rush of the harvest season is over a month or two later, pull out the tomatoes, slip off their skins under hot water, and run them through a hot water bath canner or a pressure canner.